Notes: Safety Water is a Direct Request. Smoky Images drop from Indian Pipes. 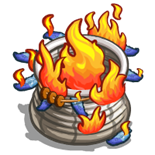 Burning Baskets are crafted.